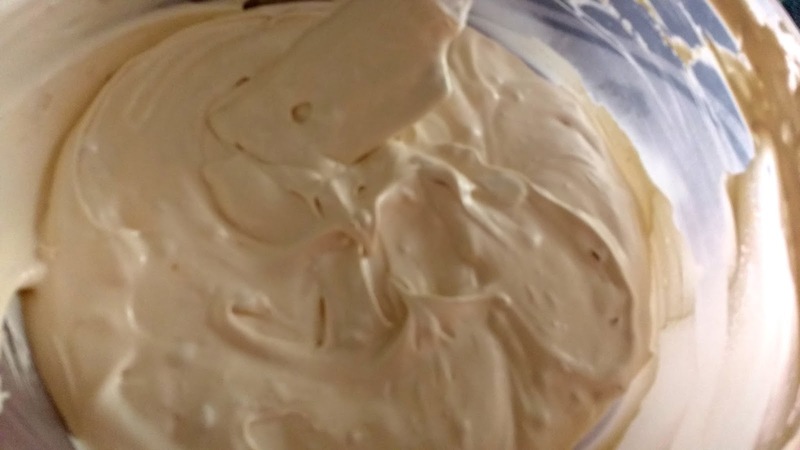 Dulce De Leche (DDL) ice cream is a rich delicious ice cream made using whipping cream and dulce de leche which is a kind of creamy milk caramel. In this post I am going to share 2-Ingredients No churn DDL ice cream recipe. 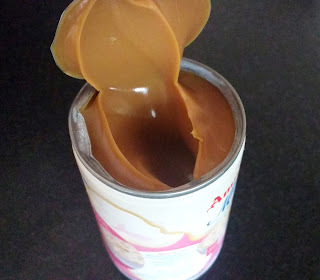 I stumbled upon Dulce De Leche or DDL in a food group on Facebook where one of the members had shared the method for preparing it at home using condensed milk tin. I tried it at home and yes, it was really yummy!! Earlier, I had shared a Banoffee Pie recipe in which DDL was being used. This summers I used it for making ice cream and definitely it has not disappointed me. Dulce de leche has nice golden caramel colour. It is thick in texture with really sweet too. When combined with heavy whipping cream, it gives a delicate colour and sweetness to the ice cream. 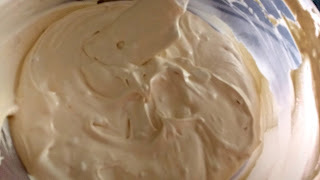 The DDL ice cream recipe I am sharing is easy to make and does not take much time in preparing also. The ice cream comes out really light, beautiful with underlying tones of caramel. It is so delicious that you wont be able to stop yourself from taking second serving!! From usual ice cream flavours, DDL ice cream flavour stands apart. It is a must try this summers. I have used Tropolite brand non dairy whipping cream in this recipe. You can use any brand's heavy whipping cream. Just make sure it is chilled before you start whipping it. If you are making Dulce de leche from scratch, you can use any brand's condensed milk like Milkmaid or Amul Mithaimate!! I like to serve and eat this ice cream as it is. You may garnish it with some chocolate chips or caramel sauce at the time of serving!! Hope you would like this DDL ice cream recipe!! The first step of the recipe is preparing DDL or Dulce de Leche. You can buy dulce de leche tin directly from any store or prepare it on your own using condensed milk tin. I have made it using Amul MithaiMate. It is a simple process. The only thing to remember is to use it when it is cooled completely. For step by step method to prepare it, click here. 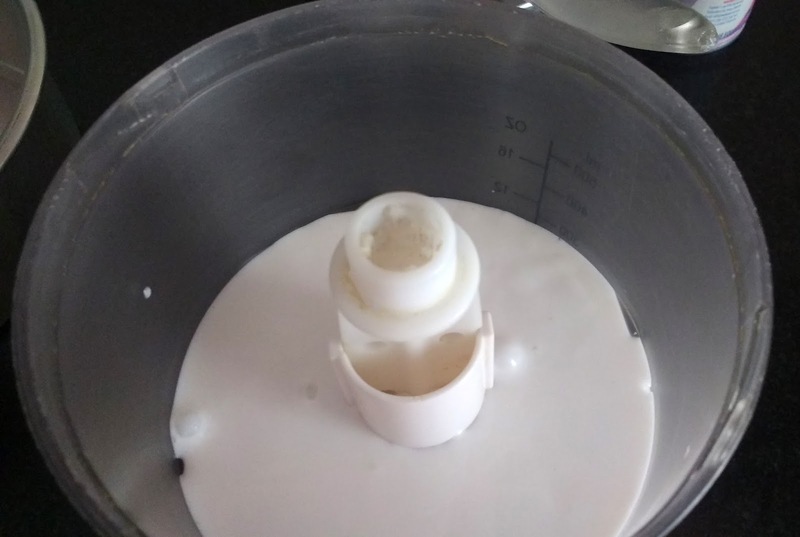 Take chilled heavy whipping cream in a bowl. 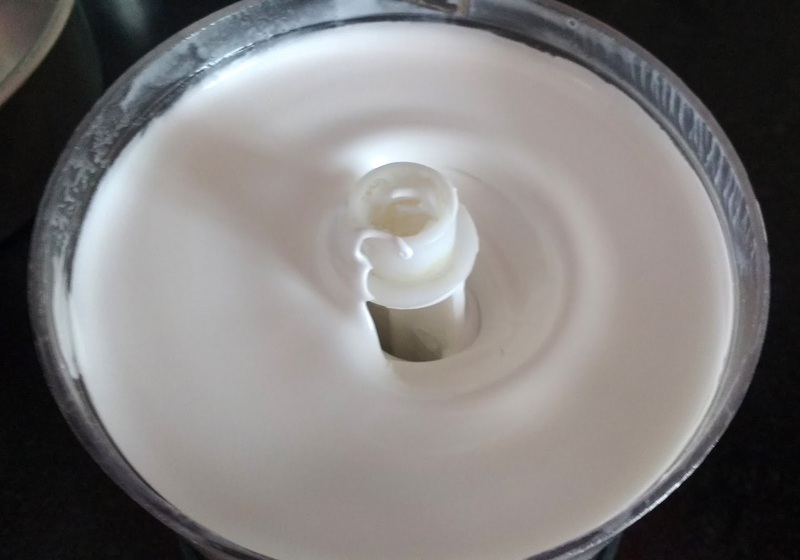 Using a hand blender or mixer, whip the cream till it is light and soft peaks are formed. If required, powdered sugar should be added in this step once the cream has whipped. Whip once again till sugar is mixed properly. As you can see below, I transferred the cream in mixing bowl. It is Morphy Richards Vivo Chopper which comes with a chopping and whipping blade. It is quite handy and has solved most of my chopping and whipping needs. For product specifications and price, you can check out the link here. It took me around ten minutes with intermittent pulses to whip this much amount of cream. It has almost doubled up in volume. The soft peaks are formed and cream has turned quite fluffy. Take the whipped cream in a mixing bowl. Add Dulce de leche to it. Adding vanilla essence at this step is optional. Mix gently to form an even mixture. Take any airtight container. Transfer the ice cream mixture into it. Cover it with cling film carefully. Put on the lid. Here I have used my regular cake tin for it. I have first covered the ice cream tin with a cling film and then with a aluminium foil. Also, I have put up a rubber band along the sides to secure it. Refrigerate the mixture for 6 to 8 hours or overnight. Serve chilled. 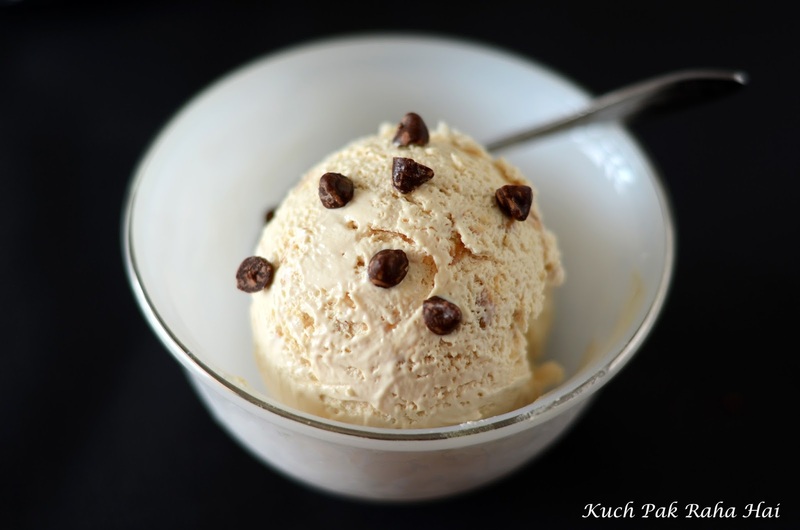 Scoop and enjoy this rich and creamy 2- Ingredients DDL ice cream. You can garnish it with chocolate chips or caramel sauce!! Non dairy whipping cream has sugar in it nd condensed milk too has sugar...just wanted to knw tht wont the icecream will become too sweet? Hi Pooja.. non dairy whipping cream is mildly sweet and moreover sweetness tastes lesser when frozen as compared to when we prepare the base. You can slightly alter the proportions to adjust the sweetness if you want to.